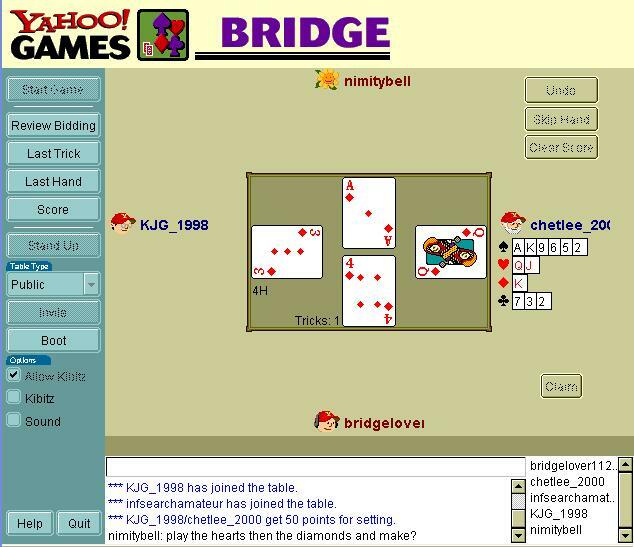 Play free Yahoo Bridge Multiplayer Online games. Harold S. Vanderbilt perfected the rules of contract bridge in 1925, adding the concepts of vulnerability and slam bonuses while refining the scoring for game bonuses and penalties. When he and three auction bridge friends tried out the new game on a cruise from Los Angeles to Havana in 1925, modern bridge was born. Players form two two-player teams, known as partnerships. Partners sit across the table from one another. At the following table, for example, players in the North and South seats would compete against the players sitting East and West. Credit - 2014: Yahoo Bridge has been upgraded for Play OK Bridge!.